Image description: A photo shows a smiling blond woman wearing a curly dark haired smiling toddler in a light blue mesh wrap. They are outside in bright sunlight standing in front of a kiddie pool. The text below the photo says "All About Water Carriers, Water Wearing Essentials" and shows the Babywearing International of Phoenix logo. Our carry of the month (COTM) for July 2017 is water carriers! This post shows some of the water carriers available in our lending library and how to use them. Read to the end for how to enter the contest! 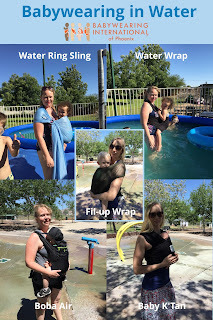 Image description: The title says "Babywearing in Water" and shows the Babywearing International of Phoenix logo. There are 5 photos tiled across the image. Each shows a water carrier. 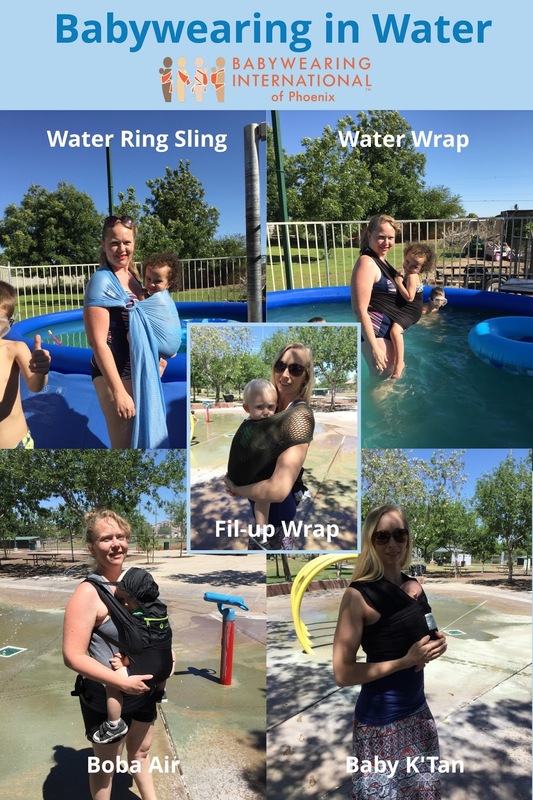 They are titled, "Water Ring Sling," "Water Wrap," "Fil-up Wrap," "Boba Air," and "Baby K'tan." If you are interested in trying out a water carrier, our lending library has several options. 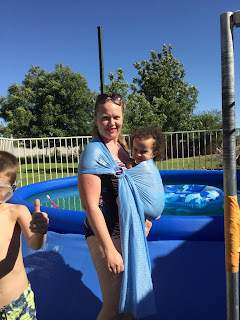 Image description: A photo shows a smiling blond woman wearing a curly dark haired smiling toddler in a light blue mesh wrap. They are outside in bright sunlight standing in front of a kiddie pool. 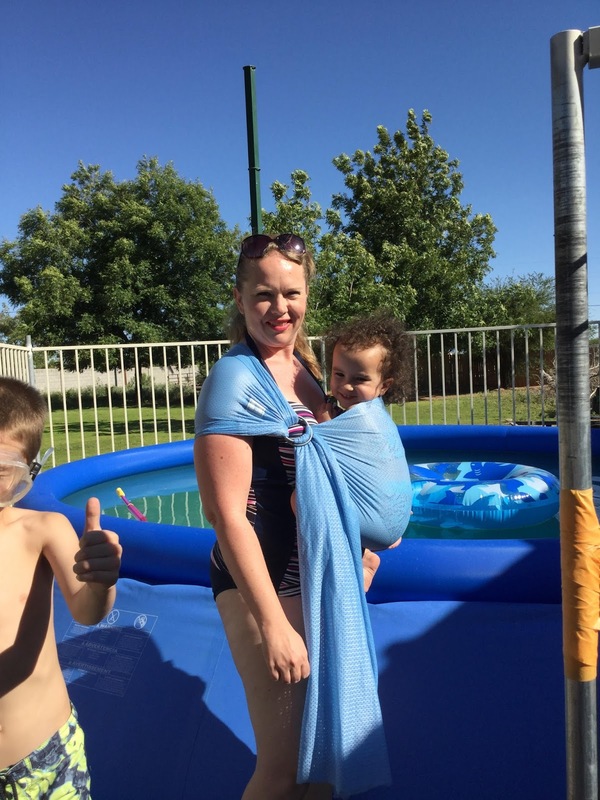 The ever popular Beachfront Baby Ring sling is great for babies and toddlers at the pool. It's made out of quick-dry mesh that is just a bit stretchy. It folds up quite small to stash in any bag on the go. Image description: A blond woman stands knee deep in an outdoor kiddie pool. She is wearing a curly dark haired toddler on her front in a thin black wrap. Another great option is the Wrapsody WrapDUO. It's made from the same thin type of fabric as most swim suits. 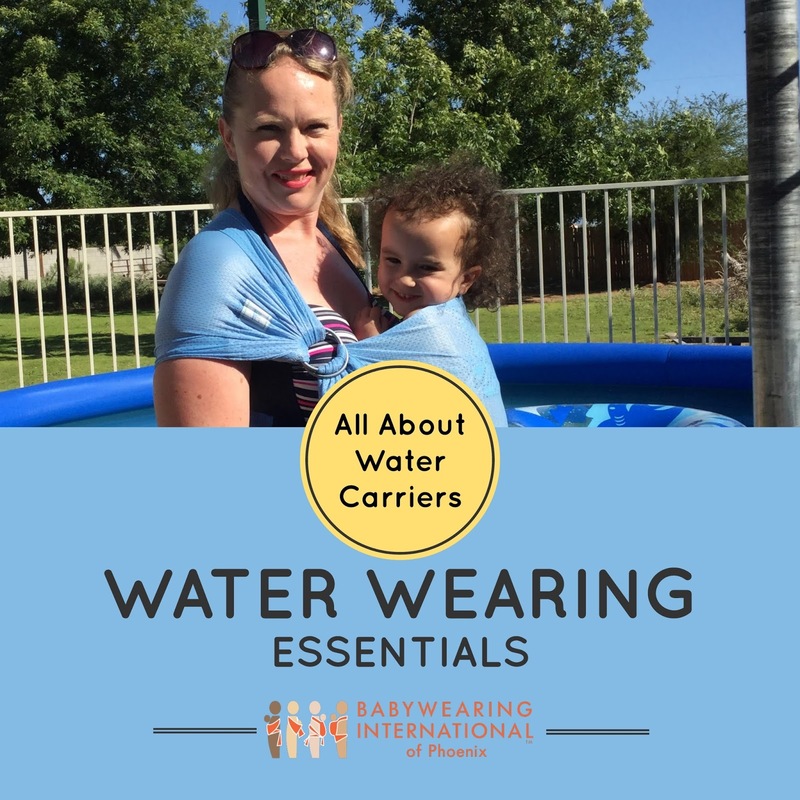 Worn in multi-pass carries, it offers secure support for hands-free babywearing in the pool. Maybe the splash pad is more your speed? We've got carriers for that, too! Image description: A blond woman wearing sunglasses wears a blond toddler with short hair in an olive green wrap that looks like a yarn net. She's standing in the shade next to a splash pad. This Fil-Up wrap is made from cool cotton mesh. Super breathable and very comfortable for both wearer and baby. You won't find another wrap quite like this one. The innovative design comes to us from France, Merci! Image description: A smiling blond woman wears a toddler in a black buckle carrier. The hood is up, shading the toddler's head. They are standing on a splash pad in the sun. If you're not up to wrapping, there is a buckle carrier for you. The nylon Boba Air won't absorb water and is free from bulky padding. It's one of the smallest structured carriers you can find. It stashes right into a small pouch when not in use! The nap hood offers shade and support when the sleepy dust hits. Image description: A blond woman wearing sunglasses has a small baby in a black wrap-like carrier on her front. They are standing in the shade in front of a splash pad. I'm sure we have some K'Tan lovers out there. Here we have the sport in extra small. It has soft cotton jersey panels to keep baby snug while the rest of the carrier is made from stretchy mesh. It's quick, comfortable, and packs right into its own sash. Our prize for July 2017 is a gift card from Luna Acupuncture! The gift card is valid for 1 session of acupuncture or acupressure. This prize was generously donated by Kari-Ann Hubbard, Dipl. O.M., LAc. Board Certified Acupuncturist and Herbalist. To enter to win, simply post a photo of you trying out a water carrier on the COTM thread in our Facebook group. If you're not on Facebook email your entry to us at PhoenixBabywearers@gmail.com. Our contributing author is Renee DeLua, our current West Valley librarian. She wears her daughter who is about 25lbs and 34" as well as her nephew who is 1 year old. A busy mom of five, Renee has accumulated over a decade of babywearing experience. She has been a VBE for the past two years after joining BWIP in 2014. She loves meeting and helping new moms, so be sure to say hi next time you see her.